Thyme CO2 Extract Oil is extracted from Thymus vulgaris (also known as Thymus aestivus, T. ilerdensis & T. velantianus) of Labiatae family. 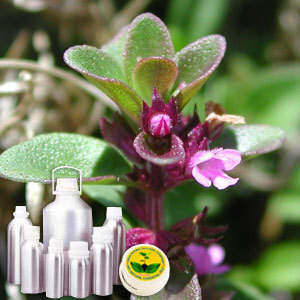 Known by the common name of red thyme, it is extracted from fresh or partly dried flowering tops & leaves of plant by water/ steam distillation process. With yield being 0.7 -1.0 % and reddish-brown to amber in color, it has rather sweet, yet strongly herbal smell. This oil helps in strengthening nerves, aiding memory & concentration as well as helping with feeling of exhaustion & in combating depression. It also helps in fortifying the lungs as well as helps with ailments like coughs, colds, asthma, sinusitis, laryngitis, catarrh, sore throats, whooping cough, tonsillitis. It is also beneficial to boost immune system as well as helps in fighting colds, flu, infectious diseases & chills. Further, as a urinary antiseptic, it is helpful for cystitis and urethritis. The warming effect of oil also helps in cases of poor circulation, arthritis, gout, rheumatism, muscular aches & pains, sport injuries & sprains. It is also helpful for cellulite, obesity, anorexia and edema as well as in cases of scanty periods, to speed up birth and leucorrhoea.